Conquest Top Gun made every pole a winning one under a confident ride by Eurico Rosa da Silva in Sunday's $148,250 Victoria Park Stakes for three-year-olds, at Woodbine. Trained by Mark Casse for the Conquest Stables of Ernie Semersky and Dory Newell, Conquest Top Gun repelled a challenge at the top of the lane from Keen Gizmo in the 1/8-miles 'Poly' tilt before coasting home a 5 3/4-length winner. Conquest Top Gun, bred in Kentucky by Dixiana Farms, arrived at the Victoria Park off a win, via disqualification, in the Marine Stakes. The bay son of Pioneerof the Nile-Early Vintage, sent to post as the 1-5 betting favourite in the Victoria Park, reached the half-mile in :49.83 and the mile marker in 1:38.46 en route to a comfortable victory in a final running time of 1:50.96. "After the quarter he relaxed beautifully and really picked it up in the stretch," said da Silva. "If another horse had come faster, he had a little more. He's a trier with a big heart." 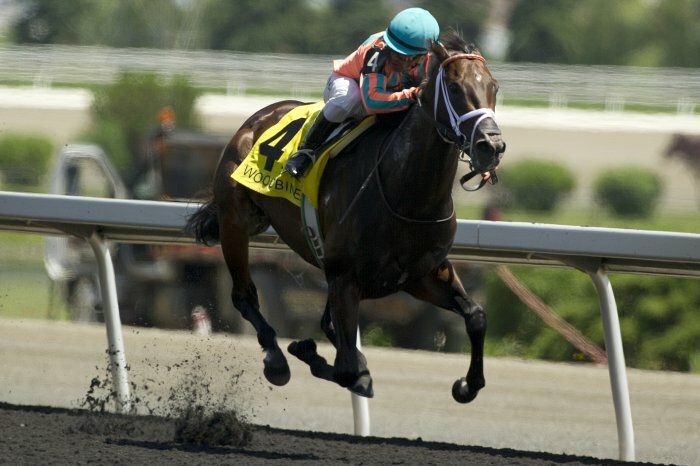 The victory capped a good weekend for Conquest Stables at Woodbine which included a stunning first stakes score by Conquest Tsunami in Saturday's Victoria Stakes for two-year-olds. "We love it here. Our first year we bought one horse and since last April we're now up to 60," said Semersky. Semersky places their success at the hands of Casse, a five-time Sovereign Award winner as the nation's top trainer. "We have 1000 percent confidence in Mark," said Semersky. "We go to the sales with him, but he works like an animal. He doesn't send a buyer. He goes and looks at 1200 horses. We have a big edge, I think, and we'll invest in Mark anytime." Conquest Top Gun banked $78,750 in victory, improving his record to 3-0-1 from five starts.